Summary: How does the NWP simultaneously impact individuals and school communities? What can local sites learn about strategies for scaling up their work? Teacher leaders and project directors involved in developing grant proposals, partnerships, or research focused on scaling up professional development or school reform efforts may find this chapter a useful resource and rich perspective on NWP’s successful “improvement infrastructure.” The authors describe what is meant by “scaling up by scaling down”: “to succeed in a new environment, a reform that is spreading geographically must also challenge and, eventually, penetrate habitual practice in new contexts.” NWP has promoted both spread and depth of change via three elements: an annual site review process; specialized cross-site networks; and a commitment to both internal, site-based, practitioner-directed research and external, national, and independent research. These elements, separately and together, enable the NWP to generalize from the diverse experiences of local sites and chart new directions for the work. 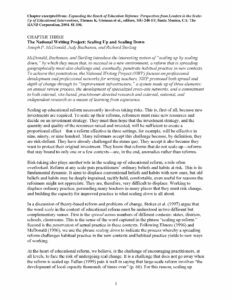 McDonald, Buchanan, and Sterling introduce the interesting notion of “scaling up by scaling down,” by which they mean that, to succeed in a new environment, a reform that is spreading geographically must also challenge and, eventually, penetrate habitual practice in new contexts. To achieve this penetration, the National Writing Project (NWP) focuses on professional development and professional networks for writing teachers. NWP promoted both spread and depth of change through its “improvement infrastructure,” a system made up of three elements: an annual review process, the development of specialized cross-site networks, and a commitment to both internal, site-based, practitioner-directed research and external, national, and independent research as a means of learning from experience.